While eating healthy can make you feel (and look!) better, sometimes it can be hard to stick with it when all you want is a slice of hot, cheesy pizza. But, really, why shouldn’t you be able to have both? On our quest to find a relatively nutritious—but still edible—frozen pizza, we recently tried VitaPizza, a new product from Vitalicious. These personal-size pizzas are only 190 calories each, and come in two flavors, cheese and tomato and meatless pepperoni supreme. We tried both, and in our opinion the cheese and tomato was the clear winner of the two. 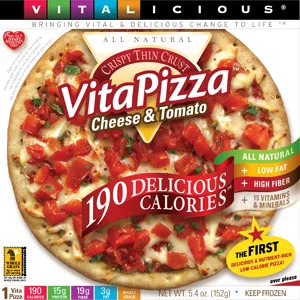 Besides being relatively low in calories, Vitalicious says its product is lower in fat (3 grams fat, 1.5 grams saturated) and higher in fiber (19 g) compared with other frozen pies. You can cook the pizza three different ways: in a microwave, toaster, or conventional oven. For those who like their pizza crispy, add a few more minutes of baking time (or 30 seconds if you prefer to microwave your pizza to go). While the microwaved pizza is OK if you’re in a rush, making the extra effort to pop the pizza in the oven is definitely worth it. Cooked in the oven, the pizza came out perfectly crispy and the cheese, warm and gooey. All in all, although it may not win over pizza connoisseurs, VitaPizzas can help fill your pizza craving for half the calories of other pizzas in the freezer section. Look for VitaPizzas at stores like Wegmans, Giant, and Target, or order online at Vitalicious.com. Are Foodie Shows Making Us Fat?